The Tuileries Palace (French: Palais des Tuileries, IPA: [palɛ de tɥilʁi]) was a royal and imperial palace in Paris which stood on the right bank of the River Seine. It was the usual Parisian residence of most French monarchs, from Henry IV to Napoleon III, until it was burned by the Paris Commune in 1871. 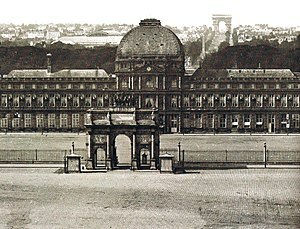 The Tuileries Palace and the Arc de Triomphe du Carrousel circa 1860. The Arc de Triomphe de l'Etoile can be seen in the background. Built in 1564, it was gradually extended until it closed off the western end of the Louvre courtyard and displayed an immense façade of 266 metres. Since the destruction of the Tuileries, the Louvre courtyard has remained open and the site is now the location of the eastern end of the Tuileries Garden, forming an elevated terrace between the Place du Carrousel and the gardens proper. After the accidental death of Henry II of France in 1559, his widow Catherine de' Medici (1519–1589) planned a new palace. She sold the medieval Hôtel des Tournelles, where her husband had died, and began building the palace of Tuileries in 1564, using architect Philibert de l'Orme. The name derives from the tile kilns or tuileries which had previously occupied the site. The palace was formed by a range of long, narrow buildings. During the reign of Henry IV (1589–1610), the building was enlarged to the south, so it joined the long riverside gallery, the Grande Galerie, which ran all the way to the older Louvre Palace in the east. During the reign of Louis XIV major changes were made to the Tuileries Palace. From 1659 to 1661 it was extended to the north by the addition of the Théâtre des Tuileries. From 1664 to 1666 the architect Louis Le Vau and his assistant François d'Orbay made other significant changes. They transformed Philibert de l'Orme's facades and central pavilion, replacing its grand central staircase with a colonnaded vestibule on the ground floor and the Salle des Cents Suisses (Hall of the Hundred Swiss Guards) on the floor above and adding a rectangular dome. A new grand staircase was installed in the entrance of the north wing of the palace, and lavishly decorated royal apartments were constructed in the south wing. The king's rooms were on the ground floor, facing toward the Louvre, and the queen's on the floor above, overlooking the garden. At the same time, Louis' gardener, André Le Nôtre, redesigned the Tuileries gardens. The Court moved into the Tuileries Palace in November 1667, but left in 1672, and soon thereafter went to the Palace of Versailles. The Tuileries Palace was virtually abandoned and used only as a theatre, but its gardens became a fashionable resort of Parisians. The boy-king Louis XV was moved from Versailles to the Tuileries Palace on 1 January 1716, four months after ascending to the throne. He moved back to Versailles on 15 June 1722, three months before his coronation. Both moves were made at the behest of the Regent, the duc d'Orléans. The king also resided at the Tuileries for short periods during the 1740s. On 6 October 1789, during the French Revolution, Louis XVI and his family were forced to leave Versailles and brought to the Tuileries where they were kept under surveillance. For the next two years the palace remained the official residence of the king. On 9 November 1789, the National Constituent Assembly, formerly the Estates-General of 1789, had moved its deliberations from the tennis court at Versailles to the Tuileries, following the removal of the court to Paris. The Tuileries' covered riding ring, the Salle du Manège (which ran along the north end of the Tuileries Gardens to the west of the palace), home to the royal equestrian academy, provided the largest indoor space in the city. The royal family tried to escape after dark, on 20 June 1791, but were captured at Varennes and brought back to the Tuileries. The following year, on 10 August 1792, the palace was stormed by an armed mob, which overwhelmed and massacred the Swiss Guard as the royal family fled through the gardens and took refuge with the Legislative Assembly. The Paris National Guard defended the King, but the daughter of King Louis XVI claimed that many of the guard were already in favor of the revolution. In November 1792, the Armoire de fer incident took place at the Tuileries palace. This was the discovery of a hiding place at the royal apartments, believed to contain the secret correspondence of Louis XVI with various political figures. The incident created a considerable scandal that served to discredit the King. At night a single lamp illumined this huge deserted hall, peopled with terrible memories. These I would often muse over as I stopped at the spot once occupied by the chair of the president, where Boissy d'Anglas had saluted the bleeding head of Feraud, and where Thuriot had listened impassively to the outburst of Robespierre at bay: "President of assassins, once more I ask your ear !" I saw in imagination the "Mountain," the "Plain," the "Marsh," and the crowded tribunes; I fancied I could hear the shrieking clamour of the "tricoteuses" and the drums of the "sections" hastening to the attack or to the rescue of the Assembly; and I would call up one or other of the acts of the mighty drama of which this sinister hall has been the scene. Military review in front of the Tuileries in 1810, by Hippolyte Bellangé. The Arc de Triomphe du Carrousel, which can be seen on the right of this painting, used to be the entrance gate of the palace of the Tuileries and, with the Pavillon de Flore, is all that remains, above ground, of the palace at the site. When Napoleon Bonaparte came into power in 1799, he made the Tuileries the official residence of the First Consul and, later, the imperial palace. In 1808, Napoleon began constructing the northern gallery which also connected to the Louvre, enclosing a vast square (place). As Napoleon I's chief residence, the Tuileries Palace was redecorated in the Neoclassical Empire style by Percier and Fontaine and some of the best known architects, designers, and furniture makers of the day. In 1809, Jacob-Desmalter, principal supplier of furniture to the Emperor, began work on a jewel cabinet designed for the Empress Joséphine's great bedroom in the Tuileries (and soon to be used by Marie-Louise). Designed by the architect Charles Percier, this impressive piece of furniture was embellished with several gilt-bronze ornaments: the central panel depicts the "Birth of the Queen of the Earth to whom Cupids and Goddesses hasten with their Offerings" by the bronzier Pierre-Philippe Thomire, after a bas-relief by Chaudet. Jacob-Desmalter completed the "great jewelry box" in 1812, with two smaller items of furniture in the same style but using woods from rainforests in China. After Napoléon's divorce, Pierre Paul Prud'hon was commissioned to design the apartments of his new wife, Marie-Louise. For the bridal suite of the new Empress he designed all the furniture and interior decorations in a Greek Revival style. The Tuileries Palace became the royal residence at the time of the Bourbon Restoration from 1814 to 1830. During the July Revolution of 1830, the palace was attacked for a third time by an armed mob and occupied. The Swiss Guards stationed at the palace, aware of what had happened in 1792 to their predecessors, abandoned the palace. King Louis Philippe I took up permanent residence there until 1848, when it was again invaded on 24 February. After the coup d'état by Louis-Napoléon Bonaparte in 1852, the Tuileries Palace served as the official residence of the executive branch of government, and when President Louis-Napoléon Bonaparte became Emperor Napoléon III, he moved from his office at the Élysée Palace to the Tuileries. 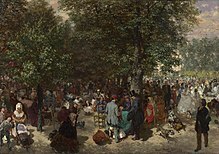 Gala soirée of 10 June 1867, for sovereigns attending the International Exposition of that year, by Pierre Tetar van Elven. The exterior horseshoe staircase, from the garden to the Salle de Maréchaux, was temporarily erected for the occasion. During the Second Empire, the Tuileries was extensively refurbished and redecorated after the looting and damage that occurred during the Revolution of 1848. Some imposing state rooms were designed and richly decorated, serving as the center stage of the ceremonies and pageantry of the Second Empire, such as on the occasion of Queen Victoria's state visit to France in 1855. The Second Empire also completed the northern wing of the Louvre along the rue de Rivoli, linking the Tuileries Palace with the rest of the Louvre, and thus finally achieving the huge complex of the Louvre-Tuileries, whose master plan had been envisioned three centuries earlier. Previously, the Place du Carrousel had been swept clear of the old houses that had encroached on it. The prominent roof-lines of the palace and especially its squared central dome were influential prototypes in the Second Empire style adopted for hotels and commercial buildings as well as residences in the United Kingdom and North America. The finalization of the long planned Louvre-Tuileries complex was not to happen. On 23 May 1871, during the suppression of the Paris Commune, 12 men under the orders of Jules Bergeret, the former chief military commander of the Commune, set the Tuileries on fire at 7 p.m., using petroleum, liquid tar and turpentine. The fire lasted 48 hours and thoroughly gutted the palace, except for the southernmost part, the Pavillon de Flore (the gate of honor, the Arc de Triomphe du Carrousel, also remains, as well as the foundation). The dome itself was blown up by explosives placed in the central pavilion and detonated by the converging fires. Observing this, Bergeret sent a note to the Committee of Public Safety: 'The last vestiges of Royalty have just disappeared. I wish that the same may befall all the public buildings of Paris' It was only on 25 May that the Paris fire brigades and the 26th battalion of the Chasseurs d'Afrique managed to put out the fire. The library and other portions of the Louvre were also set on fire by Communards and entirely destroyed. The museum itself was only miraculously saved. The ruins of the Tuileries stood on the site for 11 years. Although the roofs and the inside of the palace had been utterly destroyed by the fire, the stone shell of the palace remained intact and restoration was possible. Other monuments of Paris also set on fire by Communards, such as the City Hall, were rebuilt in the 1870s. After much hesitation, the Third Republic eventually decided not to restore the ruins of the Tuileries, which had become a symbol of the former royal and imperial regimes. However, the portions of the Louvre that had also been destroyed by fire were rebuilt in their original style. In 1882, the French National Assembly voted for the demolition of the ruins, which were sold to a private entrepreneur for the sum of 33,300 gold francs (approximately US$161,367 in 2015), despite the protests of Baron Haussmann and other members of French artistic and architectural circles, who opposed what they thought was a crime against French arts and history. The demolition was started in February 1883 and completed on 30 September 1883. Bits of stone and marble from the palace were sold by a private entrepreneur, Achille Picart, as souvenirs, and even to build a castle in Corsica, near Ajaccio, the Château de la Punta [fr], which is essentially a reconstruction of the Pavillon de Bullant. The courtyard pediment of the central pavilion can be seen in Paris' Georges Cain square [fr], some courtyard is in the garden of the Trocadero. Other pieces are in the Louvre, the Museum of Decorative Arts, and at schools of architecture, fine arts, and bridges and roads. The Tuileries Garden (French: Jardin des Tuileries) covers 22.4 hectares (55 acres); is surrounded by the Louvre (to the east), the Seine (to the south), the Place de la Concorde (to the west) and the Rue de Rivoli (to the north); and still closely follows the design laid out by the royal landscape architect André Le Nôtre in 1664. The Galerie nationale du Jeu de Paume is a museum of contemporary art located in the northwest corner of the garden. Originally designed in 1564 as an Italian Renaissance garden by Bernard de Carnesse, the Tuileries Garden was redesigned in 1664 by Le Nôtre as a jardin à la française, which emphasized symmetry, order, and long perspectives. His formal garden plan drew out the perspective from the reflecting pools one to the other in an unbroken vista along a central axis from the west palace façade, which has been extended as the Axe historique. This straight line which runs through the Place de la Concorde and the Arc de Triomphe to La Défense was originally centred on the façade of the Tuileries, a similar line leading across the entrance court of the Louvre. As the two façades were placed at slightly differing angles, this has resulted in a slight 'kink' on the site of the palace a feature ultimately dictated by the curved course of the River Seine. After the palace was demolished in 1883, the large empty space between the northern and southern wings of the Louvre, now familiar to modern visitors, was revealed, and for the first time the Louvre courtyard opened onto the unbroken Axe historique. 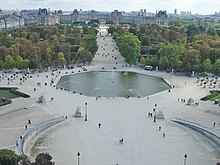 Since 2003, the Comité national pour la reconstruction des Tuileries has been proposing to rebuild the Tuileries Palace. This effort is similar to the proposal of reconstruction of the Berliner Stadtschloss (Berlin City Palace). There are several reasons for rebuilding the Palace of the Tuileries. Ever since the destruction of 1883, the famous perspective of the Champs-Élysées, which ended on the majestic façade of the Tuileries Palace, now ends at the Arc de Triomphe du Carrousel, formerly centered on the Tuileries but now occupying a large empty space. The Louvre, with its pyramid on the one hand, and the Axe historique of the Place de la Concorde-Champs-Élysées-Arc de Triomphe on the other, are not aligned on the same axis. The Arc de Triomphe du Carrousel fortuitously stands near the intersection of the two axes. The Palace of the Tuileries, which was located at the junction of these two diverging axes, helped to disguise this bending of the axes. Architects argue that the rebuilding of the Tuileries would allow the re-establishment of the harmony of these two different axes. The Tuileries Gardens would also recover their purpose, which was to be a palace garden. Also, it is emphasized that the Musée du Louvre needs to expand its ground plan to properly display all its collections, and if the Tuileries Palace were rebuilt the Louvre could expand into the rebuilt palace. It's also proposed to rebuild the state apartments of the Second Empire as they stood in 1871. All the plans of the palace and many photographs are stored at the Archives nationales. Furthermore, all the furniture and paintings from the palace survived the 1871 fire because they had been removed in 1870 at the start of the Franco-Prussian War and stored in secure locations. Today, the furniture and paintings are still deposited in storehouses and are not on public display due to the lack of space in the Louvre. It is argued that recreating the state apartments of the Tuileries would allow the display of these treasures of the Second Empire style which are currently hidden. In 2006 a rebuilding of the Palace of the Tuileries was estimated to cost 300 million euros (£200 million pounds sterling or US$380 million). The plan was to finance the project by public subscription with the work being undertaken by a private foundation, with the French government spending no money on the project. The French president at that time, Jacques Chirac, called for a debate on the subject. Former president Charles de Gaulle had also supported reconstruction, saying that it would "make a jewel of the centre of Paris." The vast complex formed by the Tuileries Palace and the Louvre Palace. ^ Coeyman 1998, pp. 45–46. ^ Hautecoeur 1927, pp. 123–142; Devêche 1981, pp. 9–13. ^ O'Leary, Margaret R. "Tuileries Palace Attacked, August 10, 1792." Forging Freedom: The Life of Cerf Berr of Médelsheim. N.p. : n.p., n.d. 344. Print. ^ a b Filon, Augustin (1920). Recollections of the Empress Eugénie. London: Cassell and Company, Ltd. pp. 126–127. Retrieved 26 February 2014. ^ "Fête de nuit aux Tuileries le 10 juin 1867, à l'occasion de la visite de souverains étrangers à l'exposition universelle". Paintings. Carnavalet Museum (in French). Retrieved 30 June 2016. ^ a b Filon, Augustin (1920). Recollections of the Empress Eugénie. London: Cassell and Company, Ltd. pp. 61–74. Retrieved 4 July 2013. ^ Kurtz, Harold (1964). The Empress Eugénie: 1826-1920. Boston: Houghton Mifflin. p. 56. ^ Filon, Augustin (1920). Recollections of the Empress Eugénie. London: Cassell and Company, Ltd. pp. 107–108. Retrieved 4 July 2013. ^ "Paris". Encyclopædia Britannica. 17 (14th ed.). Chicago: Encyclopædia Britannica, Inc. 1956. p. 293. ^ a b Samuel, Henry (14 August 2006). "£200m plan to restore glory of Tuileries Palace". The Telegraph. Retrieved 3 August 2016. ^ "Historical Currency Converter". www.historicalstatistics.org. ^ "Le Chateau de la Punta". Pagesperso-orange.fr. ^ Van Cappel de Premont, François. "Du Pavillon Bullant au Château de la Punta" (PDF). Retrieved 17 March 2013. ^ "The Carrousel & Tuileries Gardens". Louvre Museum. ^ "Les Tuileries Gardens. Facts. Information". Paris Digest. 2018. Retrieved 17 October 2018. ^ "Alain Boumier, président du Comité national pour la reconstruction des Tuileries, en chat sur L'Internaute" (in French). Linternaute.com. 9 December 2006. ^ "Le Palais des Tuileries va-t-il renaître de ses cendres ?" [Will the Tuileries Palace Rise From Its Ashes?]. La Croix (in French). 14 September 2008. Archived from the original on 14 September 2008. Retrieved 1 July 2015. Coeyman, Barbara (1998). "Opera and Ballet in Seventeenth-Century French Theatres: Case Studies of the Salle des Machines and the Palais Royal Theater" in Radice 1998, pp. 37–71. Devêche, André (1981). The Tuileries Palace and Gardens, translated by Jonathan Eden. Paris: Éditions de la Tourelle-Maloine. OCLC 461768004, 13623823. Hautecoeur, Louis (1927). L'Histoire des Chateaux du Louvre et des Tuileries. Paris: G. Van Oest. OCLC 1748382, 250838397. Radice, Mark A., editor (1998). Opera in Context: Essays on Historical Staging from the Late Renaissance to the Time of Puccini. Portland, Oregon: Amadeus Press. ISBN 9781574670325. Wikimedia Commons has media related to Tuileries Palace. Wikisource has the text of The New Student's Reference Work article about "Tuileries Palace".